Whole Foods puts local social engagement into the hands of store managers. General Motors organizes for social business internally, then supports regions. I co-authored this report with my colleague Senior Researcher, Andrew Jones, who’s been involved in several reports with me and knows the market which we cover in a detailed way, and provides unique insights. His deep understanding of the space, tireless research, and pattern analysis was key to this report being published. Please keep us both updated in your industry updates. For the last few years (see 2012 data). This analysis is a bellwether on how brands will spend on an integrated experience for the year. Overall, we saw brands still hold onto corporate websites, although a big jump in hashtag usage, and decline in Facebook integration. Integration to reach the Dynamic Customer a top priorty for brands. 75% of Brands integrate second screen experience, up 7%. Overall, 75% of brand ads integrated social, mobile, hashtags, or apps in their $4m, 30 second spot (that’s $133k per second), this is up from 68% integration in 2012. This second screen promotion extends engagement to their websites and social sites, fostering a further integrated experience. Of note, Oreo was able to quickly create ads on social channels that tapped into the unexpected blackout, showing their advertising and marketing prowess, cross-screen. Expect this growth rate to only continue in 2014, as ads should cross the 80-90% integration rate. Hashtags, presumably aimed for Twitter, dominate over Facebook. Hashtag integration in ads dominated the airtime, with 38% of ads including Hashtags in visual display on ads, up 31% out of a total of 64 ads. 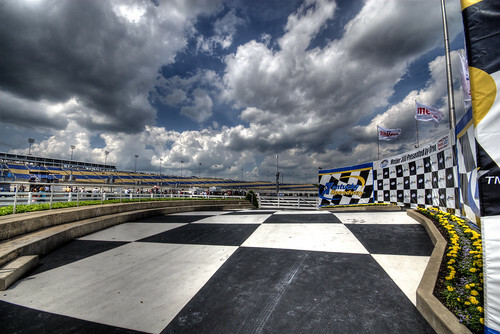 Twitter, a media-centric, network serves better for real time interactions of live events, rather than Facebook, which may spur deeper engagement through interactive media, social interactions, and applications. Brand advertisers chose to integrate Facebook URLs or Icons a mere 7% down 4% from 11% in the prior year. Facebook’s limited hashtag search restricts how brands can identify and engage in trends beyond a specific page. We observed that Calvin Klein trended on Twitter, at US level. Niche Players Come and Go: Shazam down, Instagram Enters. 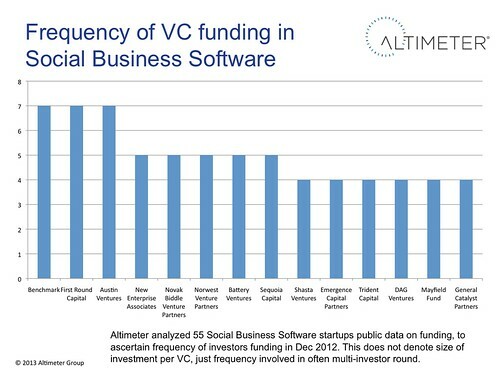 The social media space is littered with startups that come and go. And while Shazam showed some promise in last years 2012 superbowl, their brand adoption rate decreased significantly. For the first time, Instagram made an entry with Oreo, and attracts thousands of followers. While Shazam fell in adoption, QR codes and SMS messages were not present at all in 2013, despite a few experiments in prior years. Brands prefer deeper integration on their own website and leverage over-arching hashtags for events –beyond pointing to Facebook. Isolated Facebook falls in favor for these real time events, but likely provide a deeper brand engagement beyond the immediate event. While individual URLs to microsites and corporate accounts maintain dominance, Hashtags, which can be used in a variety of social networks, are permeable to multiple networks, extending broader engagement. 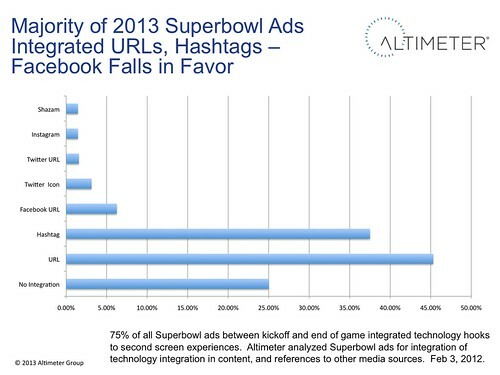 Expect that the 2014 Superbowl favors hashtags over corporate URL usage. Methods: Altimeter tallied integration in Ads from kickoff to end of game, of major ads on TV. We did not include ads involved in specific CBS promotions, instead brands that had paid airtime to reach this network. And yes, this means we maintained sobriety in the name of research. NetBase has sentiment analysis in social channels of ads, GoDaddy hated. More discussion on my Facebook post on this topic.